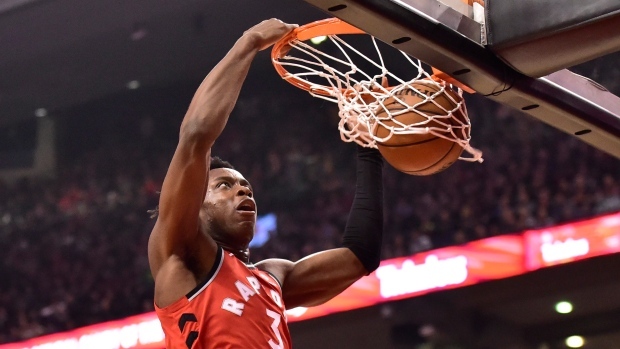 According to ESPN's Adrian Wojnarowski, Toronto Raptors forward OG Anunoby could be unavailable in the playoffs until a potential berth in the Eastern Conference finals after undergoing an emergency appendectomy. The Raptors face off against the Orlando Magic tonight to kick off Game 1 of their first-round series. Woj now reporting that Anunoby may not return until the Conference Finals, if the Raptors get that far. That would be a roughly 1-month timetable. Note: recovery from this surgery varies. Anunoby underwent the emergency appendectomy on Thursday after being diagnosed with acute appendicitis. The 21-year-old has been averaging seven points per game this season and 2.9 rebounds in his sophomore season with the Raptors.